ergoCentric announces the expansion of its North American distribution partnership with Scandinavian Business Seating, offering the full range of RBM Noor and Ana seating. ergoCentric announced its distribution agreement with Scandinavian Business Seating, owners of the HÅG, RH, BMA and RBM brands, earlier in 2016 with the availability of the legendary HÅG Capisco and HÅG Capisco Puls. 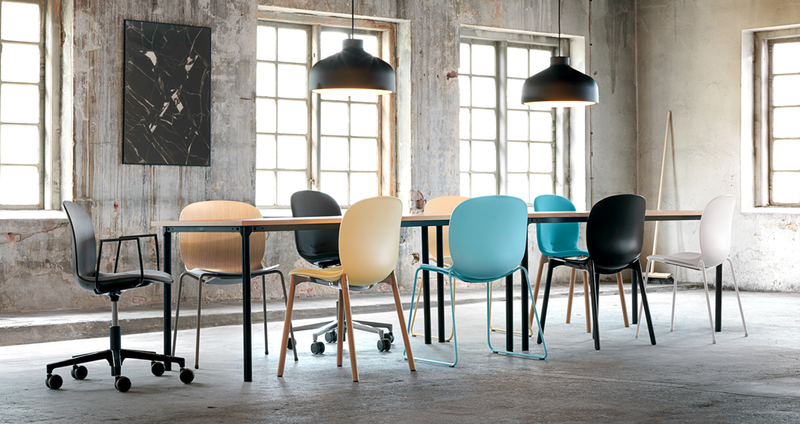 With Danish roots, RBM is a furniture brand that aims to create positive meetings between people through Scandinavian design, offering an assortment of versatile, colourful chairs which fit perfectly into any room or environment. Available with four different bases, six colors of polypropylene and two veneer models, RBM Noor chairs offer a great deal of variety and choices for all users and are ideal for meeting areas, conferences, canteens and the education sectors. In 2013 RBM Noor was awarded the Red Dot: Best of the Best Design Award. One of RBM’s most popular chairs, Ana has been around for over three decades and can be described as a lot of chair for your money. With more than 1.5 million Ana chairs in assembly halls, canteens, meeting rooms and cafeterias throughout Europe, it’s fair to say that Ana is a retro classic. Both RBM Noor and Ana are available immediately for Canadian and US dealers to order.